Yesterday on the website of the local Twin Falls newspaper there was a major story concerning a “secret society” controversy between Republican leaders at the county level. The Bonneville County GOP Chairman Doyle Beck, using the camera and recording function on his phone, recorded a conversation he had with GOP State Chairman Steve Yates about something called the Prosperity Project. Beck was interested in finding out what Steve knew about it. Steve Yates basically said he would be interested only if somebody paid him to be interested even though the Prosperity Project has something to do with outsiders coming in to take over the Republican Party leadership positions. Yates called this “a local project to flip the precincts” which means this group that is being called a “secret society” intends to replace some of the leadership in GOP – and Doyle Beck is targeted. Yates was pretty cagey but I have no doubt that he knows what’s going on. He just didn’t want to tell Doyle Beck because Doyle is going to blow a gasket when he finds out. Here’s the story Doyle… and this is for everybody’s grandchildren. Bob is the founder of the E Center and later helped found SIRI. He is a partner with the RenewableTech Ventures and Epic Ventures. Prior to his work in the eastern Idaho region, he was chairman and chief executive officer of Rockford Corporation. Bob specialized in management team building, sales and marketing strategy development. He completed the Executive Program at Stanford University and holds a BS in finance from Brigham Young University. To help with the study, Regional Economic Development for Eastern Idaho (REDI) and the Idaho National Laboratory, thanks to funds from Battelle Energy Alliance, donated $25,000 and $20,000, respectively, on Tuesday. Jan Rogers was the Director of the Southern Idaho Economic Development Organization (SEIDO) located in Twin Falls. She resigned from that position sometime in the summer of 2015. The announcement of her appointment to the Regional Economic Development Corporation (REDI) says that REDI was formed out of two economic development organizations – one in Bonneville County and one in Bingham County. “We are thrilled to have Jan Rogers join REDI as CEO” said Park Price, President REDI and the Chairman of the Bank of Idaho”. According to a REDI press release on July 23, Rogers is responsible for the “Magic Valley Miracle” because of SEIDO’s success in landing food manufacturing giants such as Chobani and Clif Bar. SEIDO is embedded in the office of the President of the College of Southern Idaho. The following is a diagram on the various entities that are operating from within the College of Southern Idaho (CSI) that have nothing to do with the mission of educating Idaho young people. Notice that Jan Rogers is or was on the Board of Directors of the International Economic Development Council. And she is connected with Obama’s Select USA program that seeks foreign direct investment in the U.S. They are not particular where the money comes from – nor are they concerned about destroying the culture and character of American rural communities. In fact, their objective is to destroy that culture and character by changing the demographics, the politics and the “governing structure” of the region. While Jan Rogers was at SEIDO, she brought Chobani, Inc. formerly Agro Farma to Twin Falls. Hamdi Ulukaya, CEO of Chobani is a Turkish Kurd. He came to the U.S. in 1994 as an exchange student. There is a lot to say about Hamdi Ulukaya that that can’t be said here because the story is too long. Suffice it to say that the Fulton County Economic Development Corporation in New York ensured his success by facilitating substantial loans and grants to him from banks, but also the state and federal governments. He had the political support of Senator Chuckie Schumer and New York Governor Andrew Cuomo during the New York phase of Agro Farma. When the pieces of the puzzle of Hamdi Ulukaya are all laid on the table, they don’t fit a normal business model. He was given extraordinary assistance that he was not qualified on any level to get. In Twin Falls, Jan Rogers of SEIDO also extended extraordinary assistance to Ulukaya. 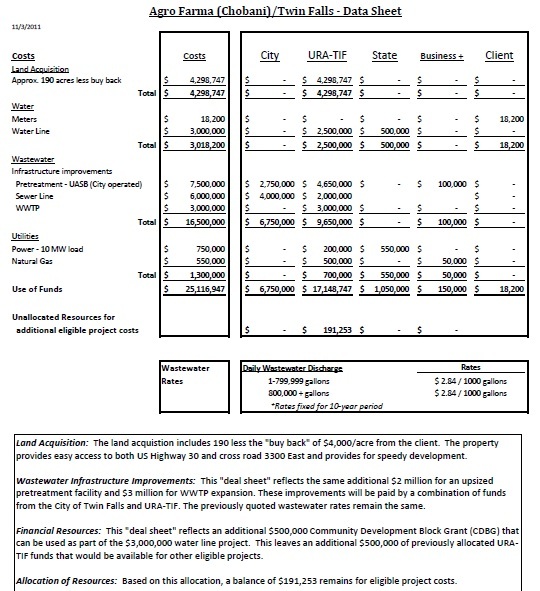 The Deal Sheet that was published on the Twin Falls City website showed that Ulukaya, an alleged billionaire put in only $18,000 on a $25 million deal for the property and infrastructure requirements for Chobani in Twin Falls. Curiously, that $18,000 was for water meters. Historically, community colleges’ role in the local economy included: 1) it’s presence (payroll, purchases, etc. ); 2) preparing students to enter the workforce; 3) improving basic skills; 4) providing the first two-years of education for professionals; 5) providing business specific courses; 6) providing student interns and co-ops to area businesses; 7) pre-screening for employment in area companies; 8) providing placement service for students; and, 9) providing customized training for local companies.24 Again, all of these services center around education and workforce development. Community colleges can, and should, play a larger role in community and economic development. They can serve as leaders for resolving community issues even when a solution is not one of education. Community colleges are comprised of highly educated and creative people who can assist with problem-solving in any number of issues that may affect a community. This is especially true for rural community colleges (over 50% of the community colleges in the U.S.) as these institutions are often the only institution of higher education in the region. History suggests that rural communities are often difficult to change because of highly entrenched political and economic structures. However, community colleges as highly visible public institutions can bring together business, government, and community members as a convener of people and a facilitator of discussions around an issue. They can work to move a community forward and energize a core group of people for change with a fact-based, creative, and unemotional approach to visioning the future. Add to the unemotional approach, unaccountable because there is no accountability with this systemic change in our government structure. In the “reinvented” governing structure, the American system of government with elected officials is being covertly replaced with a “governance” system that operates out of community colleges within rural communities. It is a technocratic fascist-led system of communism – “commun – ism”. Our elected representative government stays in place but it becomes just a façade and elected officials become eunuchs. The “commun” – partnership of business and governance officials operate in the shadows of the community college. That’s where the real political and economic power resides in the “commun-ist” system of governance. In the modern context, the way they keep power is through community policing. The immigrants are encouraged to demand rights and accommodations from the majority population. Trouble ensues. “Peace talks” between the immigrant community and public officials lead to the installation of the community policing program which brings members of the immigrant community into the local political power structure including the police even though they aren’t qualified. The corruption that follows causes good policemen and good public officials to leave or they are forced out. With corrupt police in place, the political machine is free to operate their corrupt system relatively openly – oppressing the majority who are left to wonder what happened to their city, county, state and federal governments because this corruption reaches all the way to the top – to the White House. What are we to do? We need to form citizen grand juries to investigate this systemic corruption and to begin to educate the public on the form of “governance” that has been imposed upon them. They need to understand how our elected, representative government has been gutted and dis-empowered – replaced by the system of “governance” that is operating out of the community colleges and universities and how it is nourished by federal programs and money. And it is imperative that these investigations begin immediately while there is still a chance to save our country from the ravages of communism or fascism depending upon which side of the “power line” you sit. Please watch this video and consider the information that I’ve given you as the method of the infiltration that they speak of in the video.